Blog Link: Are Recent Restroom Laws the Same as Jim Crow Laws? Jim Crow laws made arbitrary distinctions based on skin color. For example, the color of a person’s skin matters nothing to their hunger or ability to purchase food, but Jim Crow laws prohibited African Americans from entering certain restaurants. There’s no rational purpose to deny a person access to a particular restaurant because of an arbitrary factor like skin color. Those laws were senseless and irrational. HB 2, however, makes rational distinctions based on the very real differences between men and women. Therein lies the rub. Are there “very real differences” between the sexes? Walker’s post hangs on that sentence. Astonishingly, one of the most important questions we can ask ourselves today is, “Is gender something?” While so many people fight over definitions of gender this question precedes all other questions. Is gender something? Or, is it nothing? This is the center of the debate. Our nation is dividing over this question. Part of our population agrees with the statement, “Gender is something.” Part of our population agrees with the statement, “Gender is not something.” As it relates to Jim Crow laws almost no one is arguing over whether race is something or not. I believe the Scriptures teach that both gender and marriage have objective definitions. They are something. They can be defined. Notice, I haven’t defined them yet. I’ve just said they can be defined. I also believe the Scriptures account for a wide range of human experience, human sin, and divine mercy and patience for both me and those I disagree with on public policy. I believe asking the question of the possibility of objective definition can help Christians clarify their understanding of exactly what’s at stake. My hope and prayer is that Christians learn how to be both unwavering in their commitment to the authority of Scripture and patient and loving and winsome to surrounding culture. I highly recommend following the ERLC and its President Russell Moore as they model what I believe is a Biblically faithful witness to culture. I hate, hate, hate commenting on politics. But, as a pastor who gets asked a lot of questions about how our faith intersects with the political realm I do feel the need to share some thoughts. I won’t address any candidates here. My goal is the help you understand how I think about politics and in doing so, perhaps, help you think more deeply and critically as well. Chances are you have Christian friends who obsess over politics. Their social media feeds flash every 15 minutes with a new video, article or advertisement for a candidate. On the other hand you have Christian friends who may not even vote. They have no hope in politics, and don’t believe Christians should engage in the systems of the world. “Our job,” they say, “is to evangelize the word, not try to make it better.” How do you account for those extremes? Both friends love Jesus. They both profess their own personal need for grace. Yet, they live by seemingly opposite motivations, fears, and hopes. 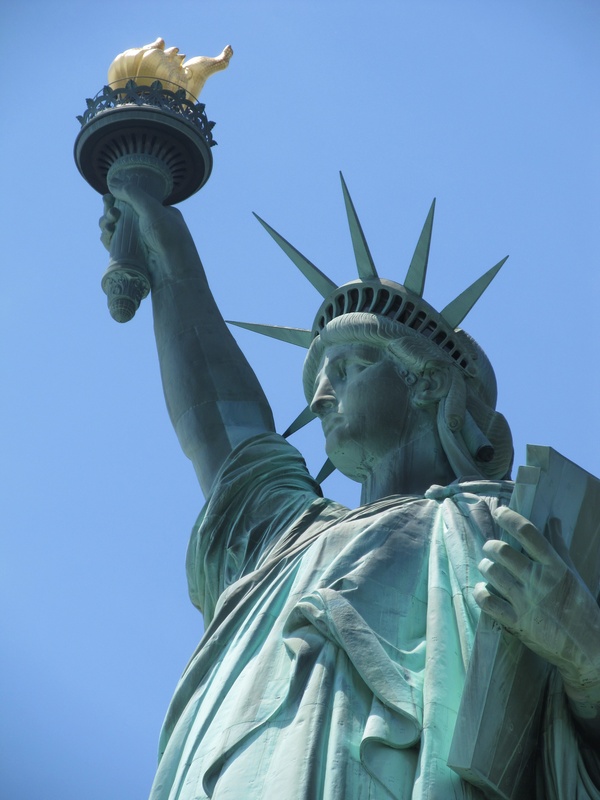 Should we be pessimistic or optimistic about the possibility of cultural change? Is the current culture redeemable and good, or fundamentally fallen? These two axes represent the spectrum of answers to Keller’s questions. Someone who believes the world is full of God’s common grace, and that nonbelievers can understand and live by God’s natural revelation would be at the top of the graph. They also believe that God is heavily at work in the culture of the world. Those who believe the world and it’s systems are fundamentally evil, that non-believers can know little of God through natural revelation, and that God is working only in the church (not in the culture) fall to the bottom of the spectrum. As you move to the left you become less engaged culturally/politically. Move to the right and engagement increases. Now, let me put some names on the graph. I admit that this is an over-simplification. Forgive me. The Moral Majority/Religious Right would occupy the lower right quadrant. They believe the world is fundamentally fallen, but are optimistic that through political endeavor they can change culture. Mainline liberal Christians occupy the top right. They’re just as active in politics as the Religious Right, but they have a more positive view of the world. 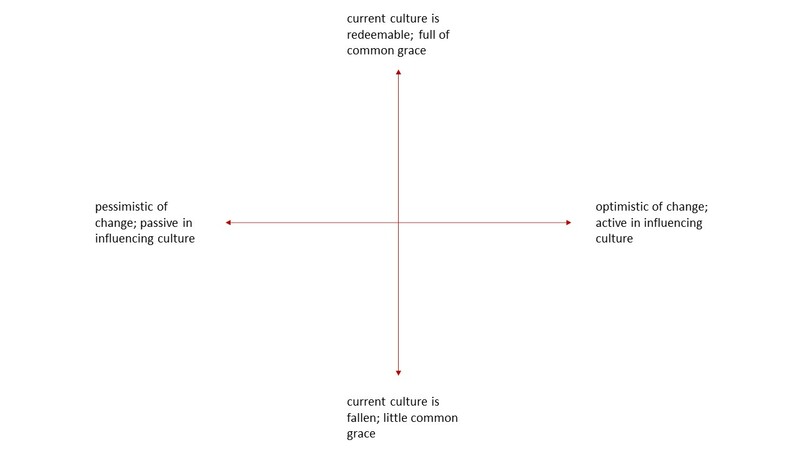 Martin Luther and churches that hold to a Two Kingdoms doctrine represent the top left quadrant. Because they believe the world is full of common grace they focus on doing their personal work excellently and humbly before the Lord. Because they hold a strong discontinuity between the church and the culture they are typically pessimistic/indifferent to cultural change. Anabaptists and Amish groups fill in the bottom left. This quadrant is the most isolationist. There is little common grace in the world, and zero desire to change culture, therefore they establish their own, separate community over and against culture. At different times in your life you will likely move between these poles. At times you will feel more optimistic politically; at times more pessimistic. This means that at times you will feel guilt over being overly engaged in culture/politics. It also means that at times you’ll feel guilt over being disengaged. Ask yourself why. Why am I currently obsessing over the political/cultural? Am I obsessing because I feel the threat of change to the way of life I agree with? Am I obsessing because I feel oppressed and believe that change will make me happier? Try to discern your heart. If things change for the worse will I be despondent? Why is my mental/emotional state so heavily anchored to the preservation/adaptation of society and not in the perfect grace of Christ? If he really has delivered me out of darkness into his marvelous light why am I afraid? Seek to learn from the other views. Seek to move more towards the center of the graph. Balance pessimism with the hope that Christ is making all things new. Balance optimism with the knowledge of a yet future Kingdom where justice and righteousness reigns. Look around for signs of God’s common grace so that you don’t isolate yourself from culture. Acknowledge the evil and atrocity in the world so that you maintain realism and avoid superficial sentimentality. I’d love to hear your thoughts, where you think you sit on the plane and why. Keller, Timothy. Center Church: Doing Balanced, Gospel-Centered Ministry in Your City. Grand Rapids, MI: Zondervan, 2012.